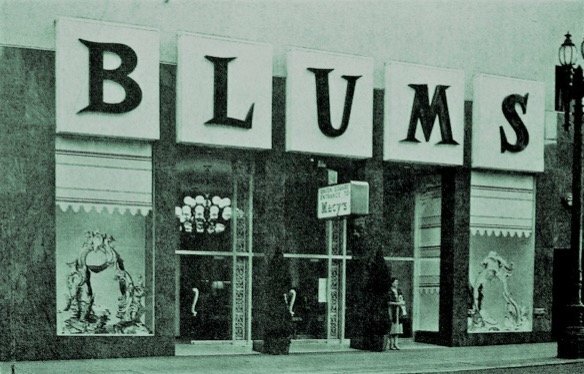 In the summer of 1965, 13-year old Betsy Block’s favorite thing to do each weekend was eat dessert at Blum’s (“never lunch, only dessert”) and see “The Sound of Music.” Eating at Blum’s always felt like a special occasion. Maybe it was the pink and white décor. Maybe it was the little wrought iron chairs and tables that made you feel like you were stepping onto the set of “The Music Man.” But mostly it was the desserts! Her favorite was angel food cake with its thin layer of cream underneath the boiled icing, but she usually ordered the Coffiesta Sundae. “It came with a small pitcher of the best hot fudge ever,” she said.